So I have decided I am out of shape. Not the ‘oh-my-god-I-am-so-fat’-so-you-pay-me-a-compliment-out-of-shape but the I-can’t-walk-up-a-flight-of-stairs-with-out-being-winded-out-of-shape. And yes I know I just recently had a baby, five months ago. And that is not what I am talking about either, remember 9 months on, 9 months off. I just am not as active as I once was and it is starting to show. I work on the sixth floor and I usually have to park on the second floor of a three floor parking garage, so this is ample opportunity to take the stairs instead of the elevator. Plus I have to go down to third floor, and back, twice a day for lactation time. Which means more stair time! To make sure I am walking as much as I can during the day I have decided to make use of the Nike Fit app on my iPod Nano. I took the stairs, six flights! Maybe that was over-kill on my first day, but I did it. 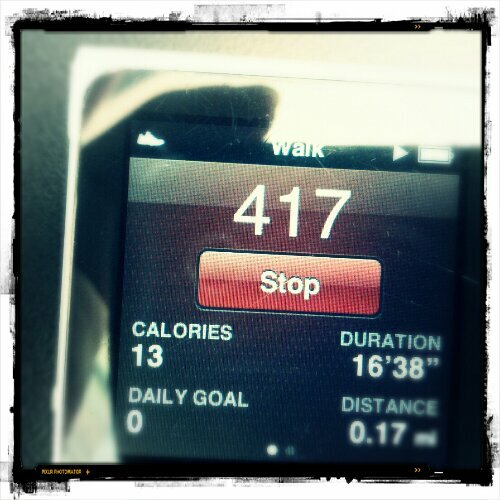 I feel that I probably should have burned more than 13 calories! OK, so it took me a while to walk from my car to my desk, and to the break room and back to my desk. I was going a little slowly up those six flights of stairs. HOLY COW were my legs burning at the top. Which confirms my theory, that I am out of shape. So from now on, I vow to take the stairs when possible. I will also be keeping track of my steps, and hopefully it won’t take me almost 20 minutes to get to my desk in the morning. I will also be taking ‘walking breaks’ while at work. As you, my readers, love to hear all about my life, I will be sharing this journey with you as well. Every single step of it. Categories: Fitness, Health | Tags: Fitness, Health & Fitness, Health and Fitness, Healthy Living, Nike Fit, pedometer, Use the Stairs, Walking, Weight loss | Permalink.